Lauren Elliot is a physician assistant from Philadelphia and is serving as a community health volunteer in both Huancayo and Trujillo, Peru for one year. 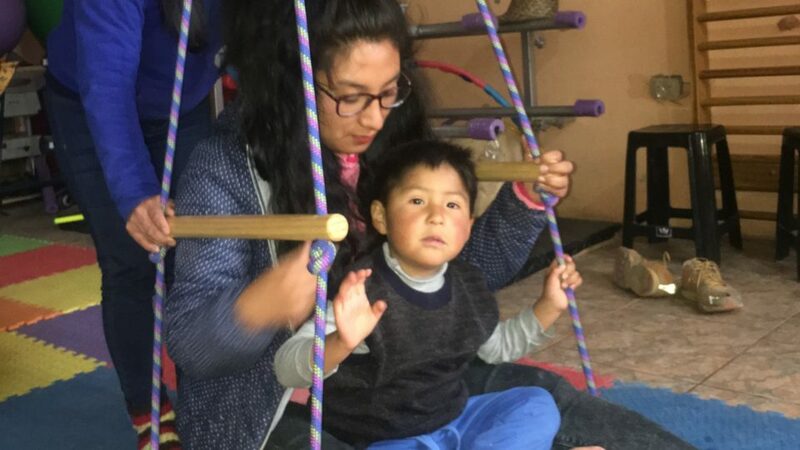 In this piece, she shares about the amazing commitment she has witnessed among mothers whose children are enrolled in CMMB’s Rehabilitation with Hope program, and the important role a community can play in changing the lives of families who have children with disabilities. Sara Dolorier is an inspiration. She is a key member in two of CMMB’s efforts to improve the lives of the women and children in Huancayo, Peru. Sara is a community health worker. In this role, she works tirelessly to guard the health and well being of the children in her community, including administering oral iron supplementation to children suffering from anemia. She does all this with the support of the CMMB nurses and volunteer physician assistant (me!) who make up the first 1,000 days team. Sara is also a beneficiary of the Rehabilitation with Hope program – a community-based project which assists children with physical and cognitive disabilities by providing much needed access to quality therapy. Her son, Milan, has special needs. Every time you meet Milan, you can’t help but smile. He’s often greets you with a giant smile and usually there’s a trace of his last meal somewhere on his face or clothing. Sara (like most of the women of Huancayo, as I’m coming to realize) does it all. 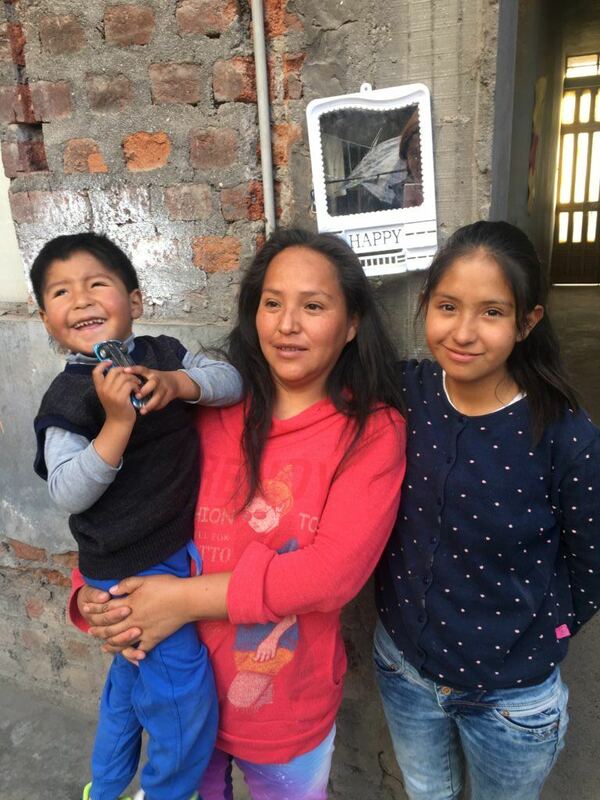 Sara raises her two children, she runs a school supplies store from her house to earn income for her family, works as a community health agent with CMMB, and also acts as a leader for her community in another relief organization in Huancayo. With all of her responsibilities, Sara is always on the run and 100% of the time, Milan is either on her hip or running behind her heels trying to keep up. But Milan poses a unique challenge. At four years old, he can only say a few words, and he walks with a wide, unsteady gait. He isn’t potty trained, and he seems to have no real sense of danger. On two occasions, I’ve watched him run into oncoming traffic before Sara swiftly scoops him up just in the nick of time. Milan began working with the skilled therapists of Rehabilitation with Hope last year, and Sara is very proud of his progress. He can now say a few words like “Mama” and “Christina” (his sister’s name). But without any formal diagnosis, the therapists are unsure what treatment plan to design. When talking with Sara, I was shocked to learn that he has never seen any type of pediatrician or neurologist for his condition and therefore has no real and accurate diagnosis. Immediately, a differential diagnosis started running through my head: Milan has mild microcephaly. This was followed by a series of questions. Could he have had a TORCH infection in utero? But his gait is more suggestive of normal pressure hydrocephalus…or is it a cerebellar disorder? Should I interrupt Sara while she tells me about Milan’s recent progress to get a full medical history? The opportunity to get a full medical history never presented itself, as Sara never circled back to his lack of a diagnosis. Milan with his mom, Sara, and sister, Christina. At first this struck me as very strange, compared to some of the other mothers in CMMB, Sara seemed to be in a relatively good position. She has a source of income with her store, her kids have nationally provided insurance (known as SIS), and she obviously loves and wants the best for her children. But when Milan’s problems first became apparent two years ago, the doctor at the health clinic referred Sara to a pediatric neurologist. The problem is that the nearest pediatric neurologist is in Lima, a nine-hour bus ride away. Both the time and monetary commitment required seemed impossible to Sara, so she never went. 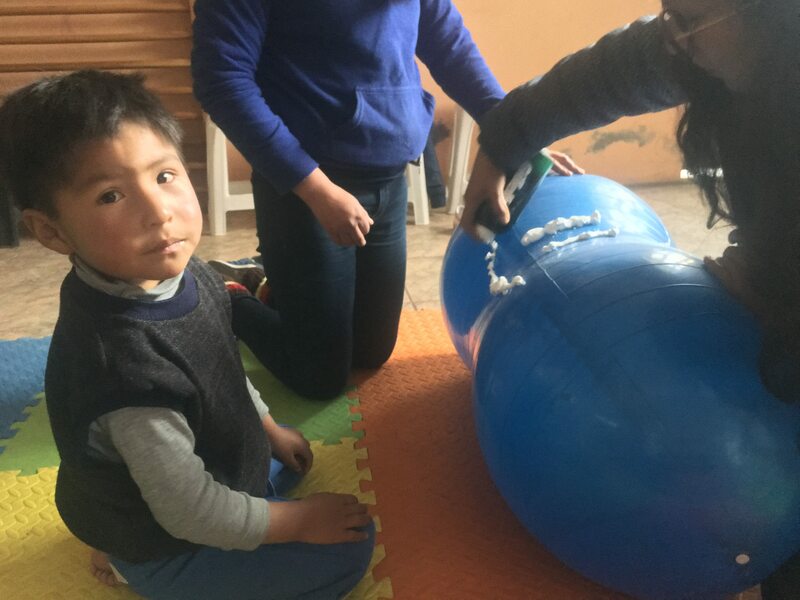 But, in yet another example of how CMMB Peru constantly goes above and beyond, the therapists of CMMB have scheduled an appointment with a pediatric neurologist in Lima and helped Sara finally figure out how she can make it work by setting aside money and time for this important trip. For her first appointment last week, Sara went all the way to Lima just to give them her insurance information and fill out paperwork! The doctor won’t see Milan until next month when she has to make the trip again. But, Sara and Milan feel well supported by the CMMB team and are thrilled with the progress he is making thanks to the amazing therapies he receives. As I’m learning, in a resource-poor setting, community support is much more important than a brain MRI or an ICD diagnosis. I am proud to be part of this team. (I’ll be back with an update soon)! Through our Angel Investor program, you can become an agent of change by providing children with disabilities the essential therapies and healthcare they need. Meet the children who need your help by clicking here and selecting ‘Peru’ on the country drop-down menu. Learn more about our projects in Peru.